Jacqueline R. Fort, 59, died Jan. 9, 2009, at home in Vero Beach. She was born in Ithaca, N.Y., and lived in Vero Beach for 26 years, coming from Orlando. She was a charter member of the Art Chicks of the Treasure Coast. 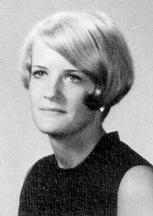 Survivors include her husband of 39 years, Albert Fort of Vero Beach; sons, Albert Lee Fort III and Tobias Fort, both of Fort Lauderdale; father, Richard Conniff of Vero Beach; brothers, Rick Conniff and James Conniff, both of Maryland, and Will Conniff of Chicago; and sisters, Pamela Conniff of Los Angeles and Patti Holland of Palm Beach Gardens. She was preceded in death by her mother, Ruth Conniff. Memorial contributions may be made to ALS Association, 3242 Parkside Center Circle, Tampa, FL 33619. SERVICES: An informal life celebration will be conducted at 3 p.m. Jan. 12 at Strunk Funeral Home, Vero Beach. Had such a CRUSH on that girl.